The Autonomic Nervous System or ANS is a major mechanism for neural control of physiologic functions. The autonomic nervous system (ANS) consists of portions of the central and peripheral nervous systems and functions without conscious control. A pharmacologic perspective based on the receptor subtypes involved. All three perspectives are valid and useful. Its role is to maintain homeostasis in response to changing internal conditions. The effectors under autonomic control are cardiac muscle, smooth muscle, adipose tissue, and glands. The ANS functions mostly by involuntary reflexes. Visceral sensory nerve impulses carried to the autonomic reflex centers in the hypothalamus, brainstem, or spinal cord cause visceral motor nerve impulses to be carried to effectors via cranial or spinal nerves. Higher brain centers, such as the limbic system and cerebral cortex, influence the ANS during times of emotional stress. The anatomic perspective separates the ANS into a sympathetic and a parasympathetic branch, based in part on the origin and length of the nerves. The sympathetic nerves arise from the thoracolumbar spinal cord and have short preganglionic neurons. The preganglionic nerves synapse in the sympathetic chain, and long postganglionic nerves innervate the final target. Acetylcholine is the preganglionic nerve neurotransmitter, and norepinephrine is the postganglionic neurotransmitter, except for the sweat glands, which have a sympathetic cholinergic innervation. There is an endocrine component of the SNS. Circulating plasma norepinephrine levels come from both overflow from the sympathetic nerve terminals and from the adrenal medulla. Plasma epinephrine originates primarily from the adrenal medulla. The parasympathetic nerves arise from the cranial and sacral portions of the spinal cord and have a long preganglionic nerve. They synapse in ganglia close to the target tissue and have short postganglionic nerves. The parasympathetic nerves use acetylcholine as the neurotransmitter for both the preganglionic and postganglionic nerves. There is not an endocrine arm to the PNS. The physiologic perspective of the ANS is based on both homeostatic control and adaptive responses. The ANS, along with the endocrine system, regulates most body functions through a standard negative feedback process. The adaptive component of the ANS characterizes the SNS as mediating “fight or flight” and the PNS as mediating “rest and digest.” This classification provides a logical structure for the diverse actions of the sympathetic and parasympathetic nerves on various target tissues. The SNS is activated by multiple stimuli, including perceived threat, pain, hypotension, or hypoglycemia. The parasympathetic nerves are active during quiescent periods, such as after ingestion of a meal and during sleep. The pharmacologic division of the ANS is based on the receptor subtype activated. The SNS stimulates a- and/or P-adrenergic receptors on target tissues. The PNS stimulates nicotinic or muscarinic cholinergic receptors on the target tissues. Cells express different receptor subtypes, and the receptor subtype mediates the action of SNS or PNS on that cell. The sympathetic nerves originate in the intermediolateral horn of the spinal cord and exit at the T1 through L2 spinal cord segments. The preganglionic nerve fibers synapse in either the paravertebral sympathetic chain ganglia or the prevertebral ganglia before the postganglionic nerve fibers run to the target tissue. The parasympathetic nerves exit the CNS through cranial nerves III, VII, IX, and X and through the S2 through S4 sacral spinal cord segments. The parasympathetic preganglionic nerve fibers usually travel almost all the way to the target before making the synapse with the postganglionic fibers. Unlike the somatic nervous system, in which a single motor neuron extends from the CNS to a skeletal muscle, the ANS uses two motor neurons in sequence to carry motor nerve impulses to an effector. The cell body of the first neuron, or preganglionic neuron, is located within the brain or spinal cord. It extends an axon from the CNS to an autonomic ganglion. The cell body of the second neuron, or postganglionic neuron, is located within the autonomic ganglion and it extends an axon from the ganglion to the visceral effector. 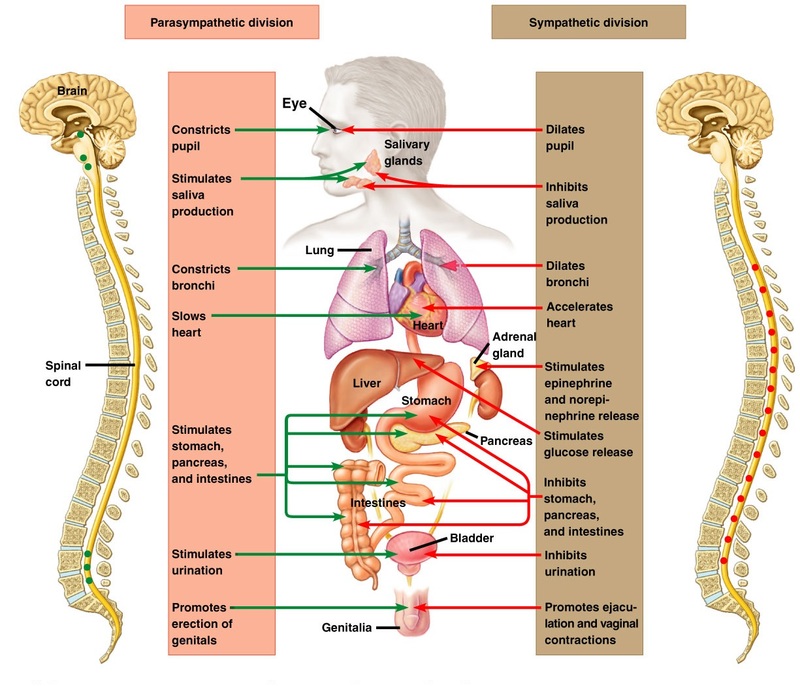 The autonomic nervous system is subdivided into the sympathetic division and the parasympathetic division. Preganglionic axons of the sympathetic division arise from the thoracic and lumbar segments of the spinal cord-spinal nerves T1-L2. Some preganglionic sympathetic axons branch from the spinal nerves to synapse with postganglionic neurons in autonomic ganglia that are arranged in two chains, one on each side of the vertebral column. These ganglia are called paravertebral or sympathetic chain ganglia. Other sympathetic preganglionic axons pass through a paravertebral chain ganglion without synapsing and extend to another type of ganglion, a collateral ganglion, before synapsing with a postganglionic neuron. Preganglionic axons of the parasympathetic division arise from the brainstem and sacral segment (S2-S4) of the spinal cord. They extend through cranial or sacral nerves to synapse with postganglionic neurons within ganglia that are located very near or within visceral organs. Most visceral organs receive postganglionic axons of both the sympathetic and the parasympathetic divisions; but a few, such as sweat glands and most blood vessels, receive only sympathetic axons. Preganglionic axons of both the sympathetic and the parasympathetic divisions secrete acetylcholine to initiate nerve impulses in postganglionic neurons, but their postganglionic axons secrete different neurotransmitters. Most sympathetic postganglionic axons secrete norepinephrine, a substance similar to adrenaline, which is why they are called adrenergic axons. Parasympathetic postganglionic axons secrete acetylcholine and thus are called cholinergic axons. Both sympathetic and parasympathetic divisions stimulate some visceral organs and inhibit others. However, their effects on a given organ are opposite. For example, the sympathetic division increases heart rate whereas the parasympathetic division decreases heart rate. The contrasting effects are due to the different neurotransmitters secreted by postganglionic sympathetic and parasympathetic axons and the receptors of the receiving organs. The sympathetic division prepares the body for physical action to meet emergencies. Its actions have been summarized as preparing the body for fight or flight. The parasympathetic division is dominant under the normal, nonstressful conditions of everyday life. Because its actions are usually opposite those of the sympathetic division, it is often viewed as preparing the body for resting and digesting. Table below compares some of the effects of the sympathetic and parasympathetic divisions on visceral organs.